We’re aware that there are some misapprehensions around about the Oxford Flood Alleviation Scheme (OFAS). The items that follow aim to clarify some of these points. Where necessary we have sought answers from the Environment Agency to be sure our facts are as accurate as possible. We’ll be adding to these points, so check back. The new bridge will continue from the existing Willow Walk track, just raised slightly higher, and will span 19 metres. It is designed to take existing vehicles and future maintenance vehicles. It will meet cycleway and British Horse Society standards and be built for a 100-year life span. Thirteen individual large trees (12 white willows and one ash) and part of two groups of smaller trees will be felled to install the new bridge over the new channel. Willow Walk is about 400m long and a stretch 170m long will be cleared in the middle of it. Once construction is complete 20 white willows (10 on each side of the path) will be planted to reinstate the avenue of trees. Both the formal public right of way (North Hinksey Causeway or Monks Causeway) and the informal right of way will be maintained near the Fishes pub. New footbridges will be installed on both to allow access across the new channel. See Planning Statement: 4.3.3 Recreation and public access. There are no plans to transport gravel or any other excavated material through North Hinksey village. The published map is, unfortunately, unclear. It makes it look as if what’s said above is indeed the case. The existing Seacourt Stream as it runs behind the gardens along North Hinksey Village and behind the Fishes will remain the main channel, there will be no change under normal conditions. The new channel below Willow Walk is not a new first-stage channel, it is a flood relief channel (sometimes known as a swale) which will only come into play during a flood: thus it acts exactly like a second-stage channel for the Seacourt Stream but at a distance from it. The swale is raised compared to the Seacourt Stream so water will only enter the swale when levels get high in a flood. The Bulstake Stream is higher than the new swale, so there will be some back-flow from that stream into the swale, reaching about as far as Willow Walk (depending on conditions). We don’t know the planning history so can’t comment on that. As far as the present scheme is concerned it is true that the trees on the left bank (i.e. left as you go downstream) of Seacourt Stream in Hinksey Meadow would be removed – that’s in order to take as little of that meadow, with its special MG4 grassland, as possible, while still allowing a two-stage channel for flood relief. There’s been a lot of discussion about this and it seems the best compromise. On the other hand the trees on the right bank of Seacourt Stream, beside North Hinksey Lane, will not be removed. In addition, new trees will be planted along the field boundary by the warehouses – and in the old paddock by the stone arch bridge on Willow Walk. Whilst dredging can be of some small benefit during normal flows, a river channel is simply not large enough to contain the high flows associated with extreme floods, even if it has been dredged. Dredging gives the impression that something useful’s being done but the reality is that it’d be largely fruitless here and certainly not enough to significantly reduce flooding from a major flood. Dredging’s not without its downsides either – for example, and not surprisingly, it seriously damages riverine ecosystems, especially when done repeatedly. Dredging the Thames would not significantly reduce flood risk to Oxford. It’s also worth noting that surveying has shown that the River Thames bed is largely stable. Areas dredged deeper would soon silt up again. The low-gradient, slow-flowing, braided watercourses of the Oxford flood plain are particularly prone to silt up again quickly after dredging. Dredging would have to be done frequently to do anything at all and even then it would not answer. If it would we’d be all for it, but it won’t. There are a few specific locations, mainly associated with bridges and culverts, where local silting does need to be dealt with (see #7 below). We have been working for over 10 years to achieve just that. 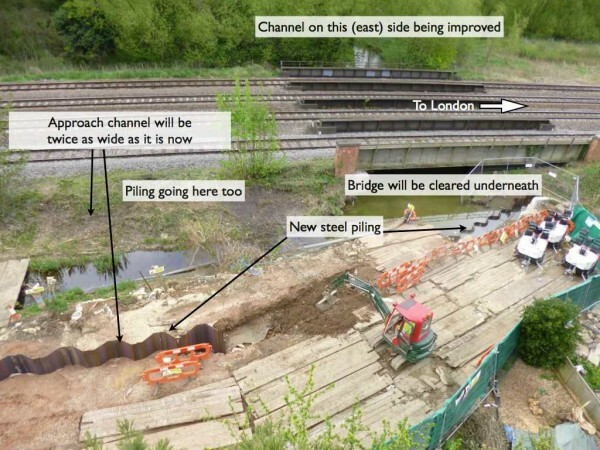 We have had considerable success – a new channel and weir at Towle’s Mill, large new culverts under the railway access road at Redbridge, removal of a redundant level crossing bridge, improvements at Munday’s bridge under the railway in Kennington, and clearance of blocked culverts under the railway at Coldharbour. Certainly these together must have helped in low level flooding – but more is still needed for bigger floods. Climate change predictions suggest these will be more likely in future. OFAS in fact provides just such further measures. As a preliminary, a new culvert was installed (taking advantage of the line being closed anyway) under the mainline railway in 2016 – this will be brought into use as an integral part of OFAS. Still to come, OFAS proposes new large culverts under the southern bypass to pull water through the floodplain; the channel banks of Hinksey Drain will be widened right up to Munday’s bridge to increase capacity, and the channel under the bridge itself will be further cleared. Together these will greatly improve the outflow from the flood plain. We have consulted the EA on this. The short answer is that the tree-planting proposal results in more woodland within the scheme after completion than at present. Edit, 6 December 2018: there is now an update on trees and OFAS here. Modelling of the scheme, with the two stage channel south of Botley Rd down to Abingdon Rd bridge removed, was undertaken by the EA. This appears as Appendix Q in the planning documents. This shows that without the two stage channel, whilst water levels are reduced from the current conditions they do not reduce as much as with the two stage channel which helps improve flow through the flood plain. Without the two stage channel the levels could still cause flooding in Osney Mead, Osney Island, Earl and Duke St and in the area of offices just west of Seacourt Street (the Minns estate). In the scenario without the two stage channel water levels south of the Devil’s Backbone (footpath to South Hinksey) are lower than with the two stage channel due to the redistribution of flows, with more water passing down the River Thames and increasing flood risk in the New Hinksey area. The alternatives which have been suggested – putting more water into the Seacourt Stream where it leaves the Thames would add water to the area where flooding is happening and would make the situation worse. The option of more culverts under the Botley Rd would potentially help move water from the north side of the road into Hinksey Meadow and would reduce the scale of the channel modifications near the Minns Industrial Estate however this would not be as cost effective as the currently proposed scheme and would not reduce levels downstream of Willow Walk. OFA believes the two stage channel is required for the scheme to work. It looks as if good progress is being made. We’re told the wooden posts will be removed, towards the end of the work. Munday’s bridge under the mainline railway at Kennington is an important route for flood water to leave the west Oxford flood plain. A lot of work was done to improve it in 2013 but the channel itself under the bridge was never properly cut and profiled and large wooden posts were left in situ in the channel. Work started yesterday to put these things right. The Thames Regional Flood & Coastal Committee (RFCC) met in Oxford yesterday. Following the meeting, members visited sites in Oxford related to OFAS. Members of our steering group were on hand to welcome them and, with staff from the Environment Agency, showed the visitors some of the problems which need to be surmounted to alleviate Oxford’s recurrent flooding. Flooding which, unchecked, is likely to threaten further the proper functioning, and the reputation, of the city in the future if (as a consensus of scientists predicts) climate change makes extreme weather more common. OFAS offers the only practicable way towards reducing this all too real danger in time. 23 May 2013. See April 24 and earlier. Work has now begun to improve Munday’s bridge, Kennington. It has been a very long wait (see 9 March) but well worth waiting for. We have been critical of Thames Water recently, over sewer flooding in various parts of Oxford, but on Munday’s we owe them a big thank you, as their work will help not only in Kennington but in the west Oxford flood plain generally. Especial thanks too to the residents who are having to put up with months of work, including pile-driving at night. River levels are still about 1m above normal in the west Oxford floodplain. This emphasises the difficulty water has in getting away from our area. It has to get under the main-line railway to reach the Thames. There are three bridges under the railway downstream of the Botley Road. We have been campaigning about the furthest downstream, Munday’s bridge, a 60ft bridge at Kennington, for some years. We are eagerly awaiting the start of a Thames Water project to greatly improve the flow of water under the bridge. There have been delays, but we are optimistic that the work will go ahead reasonably soon. This should reduce flooding of property and the railway line.